It’s snowing outside! It’s my favorite kind of snowfall, where the flakes are fat, and they shimmer down from the sky like powdered sugar, before they instantly melt as they hit the ground. There’s a new eating establishment on my block, so the snow gave me a good excuse to stay put and check it out. Unico Global Tacos. Their name is not a simple wordplay on “artistan” or “fusion”. This food is quite global, as if an individual originally from Central America, such as Mexico, had a love affair with the entire continent of Asia. There are some familiar tastes mixed with other somewhat familiar tastes, resulting in dishes that were a bit surprising. There are three steps in ordering the food. 1. 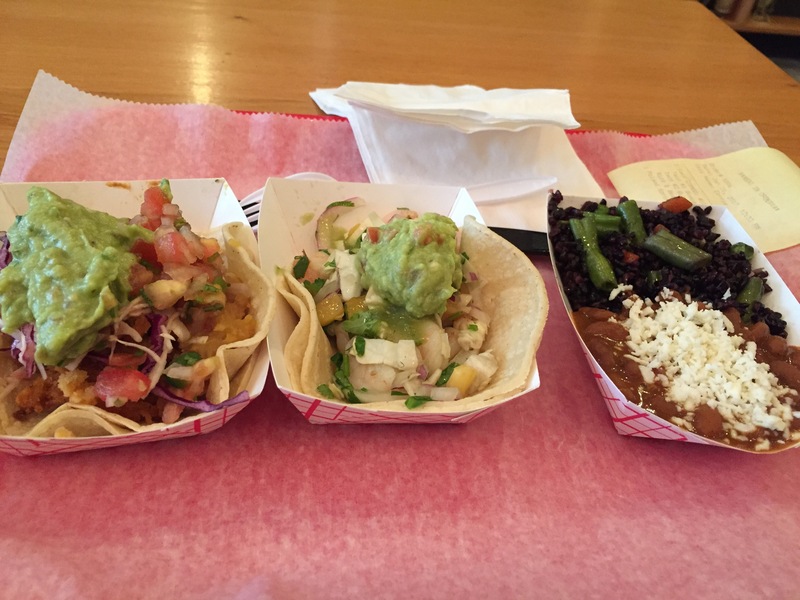 Choose your base: Taco, Enchilada, Wrap or Unico Bowl. 2. Choose your filling: Shimla (vegan option, like an Indian potato dish), Oxford (Southern-fried chicken, cabbage slaw, mashed taters [not really], salsa Mexicana), Mexico City (Adobo-pomegranate pork with pineapple salsa), Incheon (Korean beef short ribs with kimchi and salsa verde), and Lima (shrimp with jicama-mango-cabbage slaw, chikr oil and salsa verde). 3. Add sides and beverages (black forbidden rice with masala beans topped with Mexican cheese, chips & salsa, and various sodas, including Thumbs Up, a popular pop drink from India. I ordered the Any 2 tacos special (chicken and shrimp) + black rice and masala beans, with a side of guacamole ($1 extra). Along with a bottled water, the $7.95 special ended up costing $10.95 (without tax). It was, sort-of good and sort-of strange at the same time. For starters, I was the oldest person there. Then, their Lima shrimp taco, which reminded me of ceviche, made me rather nervous. What if the shrimp were not cooked all the way? (They were). The slaw with the lemon juice and chili oil was very intense on my palate. And, the Oxford chicken taco? There were no potatoes as advertised (good, didn’t need them) and the “Southern-fried” chicken was more like Chicken Katsu. The salsa made it more user-friendly. Both tacos were saved by guacamole. Guacamole can cover a multitude of sins. The rice and beans? It was really weird; the masala beans covered with cheese tasted confusing, and the forbidden rice had green string beans (not American), corn, peas and carrots. I didn’t finish the side of rice and beans and the shrimp taco. I wish this new restaurant well. However, it’ll be a while since I’ll get a hankering for Korean beef rib tacos.